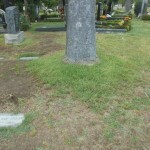 As the 19th International Sons of the Desert Convention nears, I wanted to get as many unmarked graves of Laurel & Hardy co-stars marked as possible. This is why an autograph fundraiser was posted on the Laurel and Hardywood website. 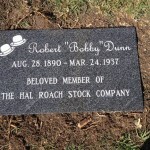 Through this fundraiser, a headstone recently was placed on the grave of character actor Bobby Dunn. Thanks to all who purchased autographed photos so far. As part of the fundraiser, a good friend of mine, Steve Cox, just posted three of my items with multiple signatures on eBay. One is a picture of the Hal Roach Studios signed by 41 actors who worked there – they even noted one of the years they worked at Roach along with their autographs. Another is a picture of Mr. Roach’s star on the Hollywood Walk of Fame signed by 59 one-time studio employees. And finally, the last picture is of the Hollywood sign autographed by 31 actors who appeared in Stan Laurel/Oliver Hardy movies, along with the titles of one of their films. The auction links for these three items are listed below. (By the way, Steve has hundreds of other items for sale; you may want to check them out.) I also listed the convention website link for the autograph sale posted by fellow Son and friend Brad Farrell. Proceeds from the sales of these items will be used for grave markers and flowers for Laurel & Hardy co-stars, and to help defray convention costs.